"Intestinal parasites, malaria, amoebas, ringworm/fungus, candida, colds, flus, skin ulcers and sores, vaginitis, adult onset diabetes (type 2 only)," from Rosita Arvigo's Ethnotany of Belize. This amazing herb is truly my favorite. It is strong and bitter! It is known for its superior killing powers of yucky conditions. This tincture should be in every medicine cabinet because it's a great addition to body detox cleanse programs or fighting the common cold. It is essential for traveling especially globally. There are many ways to use this herb including internally and topically. It even gets rid of head lice. Please contact me for specific dosage information if you are considering taking this tincture for yourself or your loved ones. I am happy to help you in a Free 15-minute Consultation. I can help you with your treatment for parasites, vaginitis, colds and flus, skin rashes, sores, and ulcers, diabetic ulcers, fungus, and ringworm. *Not to be taken in the first 20 weeks of pregnancy. Safe after 20 weeks. Safe while nursing, but watch for infant's symptoms and stop if continues. Not for infants. Only small doses for children over 1 years of age. Rare cases have been reported of photosensitivity. "At 61, Jackass Bitters is helping us lose weight slowly and safely. It eases my undifferentiated tremors. It also helps regulate my wife's diabetes. And we apply it to wood furniture so the puppy won't bite it! 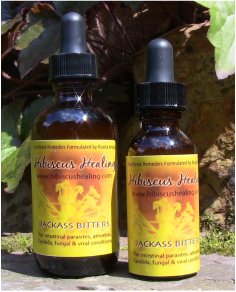 Jackass Bitters is a great herbal remedy for our whole family. We will continue to be loyal customers." 5 Ways to Use Jackass Bitters.